Please Note: This item is made-upon-order, therefore requires additional processing time, which is reflected in the estimate above. 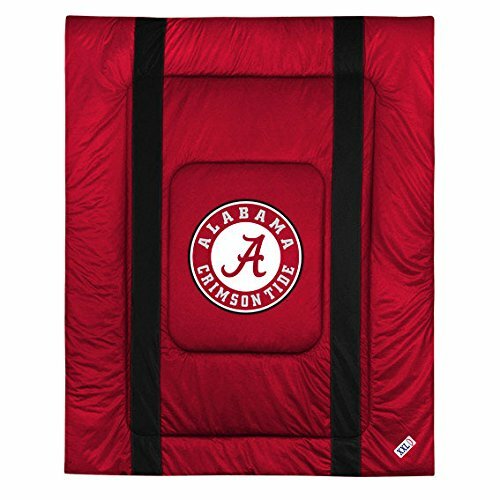 Make this comforter the centerpiece of your school's bedding ensemble. Each bedspread is made from 100% polyester jersey material (just like the athlete's wear), features a screen printed logo in the center, and contrast color material sewn down the sides. The reverse side of the comforter is a gray & white cotton blend. Available in 2 sizes: Twin (Dimensions: 86 x 66) and Full / Queen (Dimensions: 86 x 86) (add $10.00). Also available are matching pillowcases, pillow shams, bedskirt and draperies. Machine washable. LSU Tigers KING Size 14 Pc Bedding Set (Comforter, Sheet Set, 2 Pillow Cases, 2 Shams, Bedskirt, Valance/Drape Set & Matching Wall Hanging) - SAVE BIG ON BUNDLING! LSU Tigers 4 Pc KING Comforter Set, 1 Shower Curtain & Bonus 4 Pc Towel Set - Entire Set Includes: (1 Comforter, 2 Shams, 1 Shower Curtain, 1 Bedskirt, 2 Bath Towels, 2 Hand Towels) SAVE BIG ON BUNDLING! Michigan State Spartans 4 Pc KING Comforter Set & Bonus 4 Pc Towel Set - Entire Set Includes: (1 Comforter, 2 Shams, 1 Bedskirt, 2 Bath Towels, 2 Hand Towels) SAVE BIG ON BUNDLING! Michigan State Spartans 4 Pc KING Comforter Set, 1 Shower Curtain & Bonus 4 Pc Towel Set - Entire Set Includes: (1 Comforter, 2 Shams, 1 Shower Curtain, 1 Bedskirt, 2 Bath Towels, 2 Hand Towels) SAVE BIG ON BUNDLING! Michigan Wolverines 4 Pc KING Comforter Set & Bonus 4 Pc Towel Set - Entire Set Includes: (1 Comforter, 2 Shams, 1 Bedskirt, 2 Bath Towels, 2 Hand Towels) SAVE BIG ON BUNDLING!